What is motocross paradise to you? Perfect dirt? Rolling green hills? More tracks than you can ride in a week? Or, would it be being able to wake up, work on your bike in a decked-out race shop, get dressed and ride from the house? This paradise exists in Chesterfield, South Carolina, at a place called ClubMX. This paradise is a breeding ground for Pro and top Amateur riders. The camp offers everything from meal prep to training (both in the gym and on the track), lodging, and other recreational activities like fishing and wakeboarding. 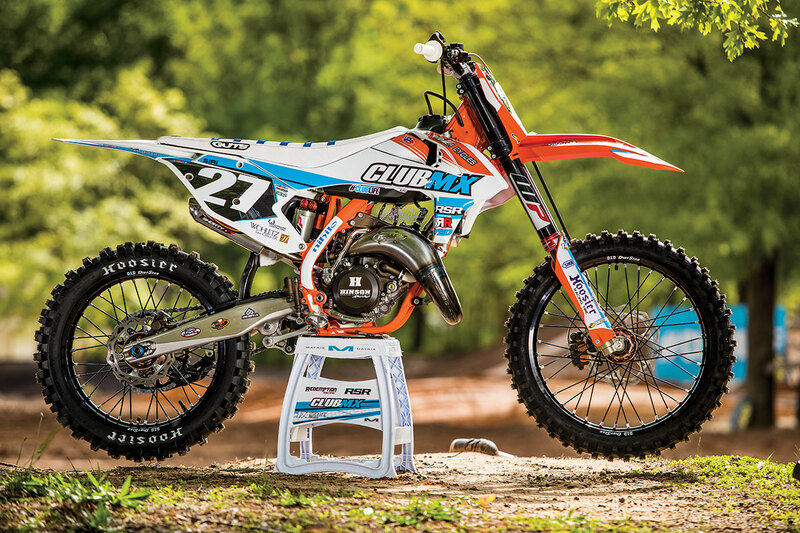 ClubMX invited MXA out to ride its KTM 150SX. The kicker is that it was set up for Supercross. Say what? THE GEAR: Jersey: Fly Racing Lite Hydrogen, Pants: Fly Racing Lite Hydrogen, Helmet: Scorpion VX-R70, Goggles: Viral Brand Factory Pro Series, Boots: Sidi Crossfire 2 TA. THIS WAS A FUN AND PLAYFUL BIKE TO RIDE, ESPECIALLY WITH THE GREEN SCENERY AND CHOCOLATE-CAKE DIRT OFFERING PRIME TRACTION. This may look like a trick Brembo master cylinder, but it is a stock part that was sent out for anodizing. The Hoosier rear tire had a soft compound that was super grippy. 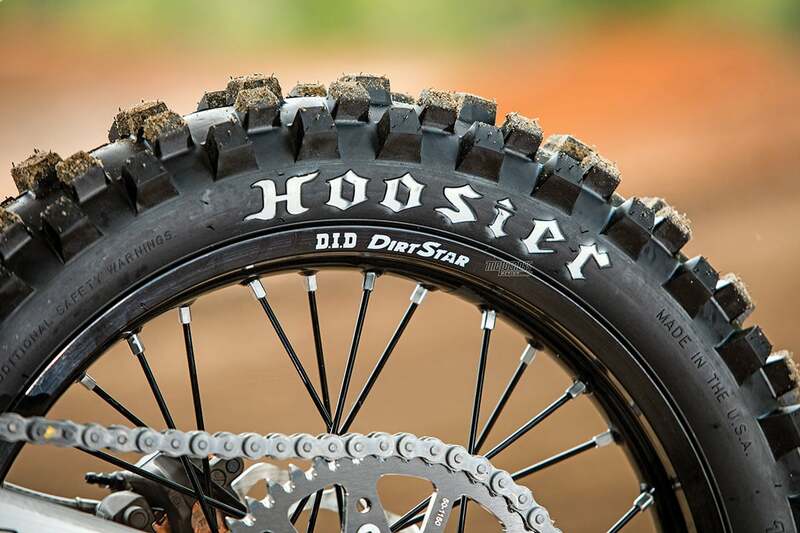 Hoosier specializes in dirt and oval car tires. We weren’t prepared to ride a two-stroke tiddler on a Supercross track. 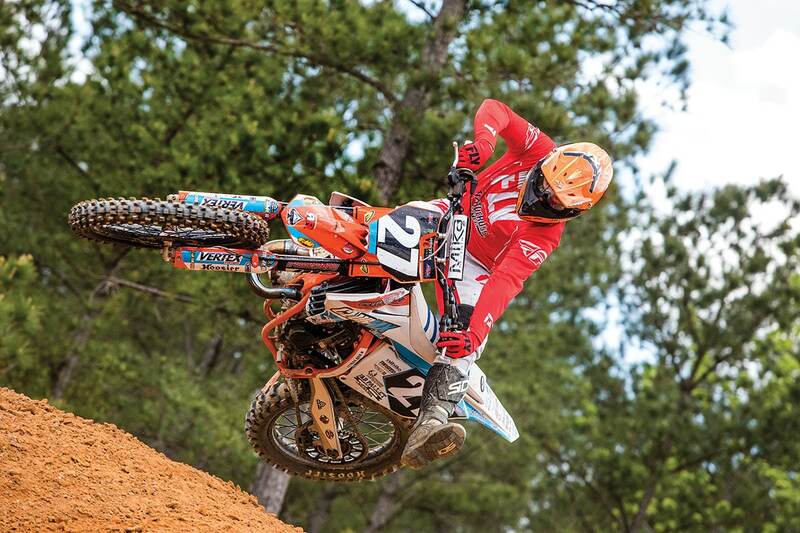 Even our top Pro test riders were wary of riding Supercross on it. We just aren’t accustomed to riding wide open and abusing the clutch out of corners to be able to make Supercross triples. (We were once, but those days are behind us—and the sport.) What if it bogs in between rhythm sections? Call us babies if you want, but we were in the middle of nowhere without a hospital in sight. 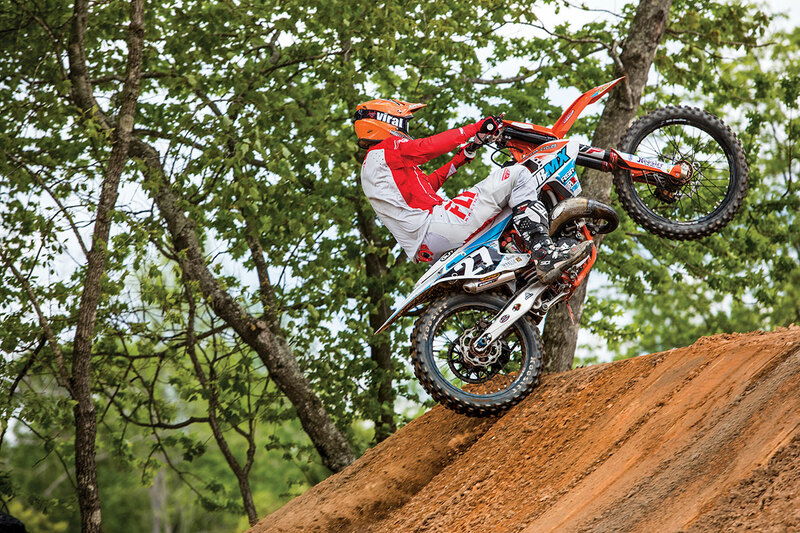 This KTM 150SX was set up for jumping. 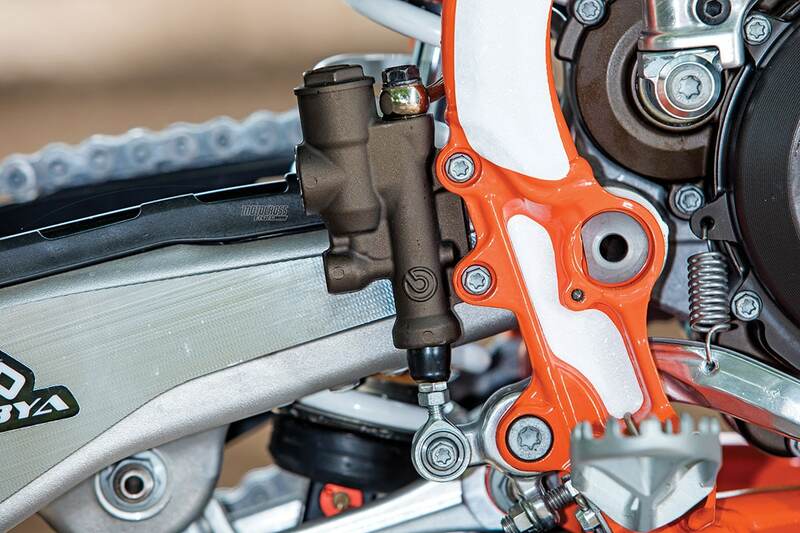 It was one of its best traits due to its Supercross-stiff suspension and snappy powerband. 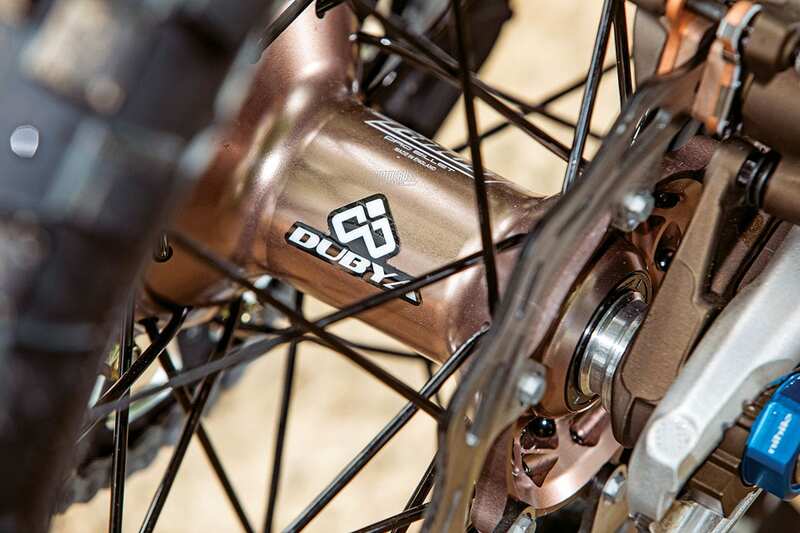 The Dubya USA hubs matched the color of the anodized parts. The rear brake master cylinder is another stock part that was changed to look very factory. We passed on ClubMX’s Supercross track, gritted our teeth and rode the beauty on a rough outdoor track. No one complained, as it rode like the wind. The engine had an FMF pipe, and the cylinder was ported. The bike looked more factory than it actually was due to all the anodized stock parts. The cylinder head, brake calipers, hydraulic clutch reservoir, engine hangers and more were anodized brown for that factory look. 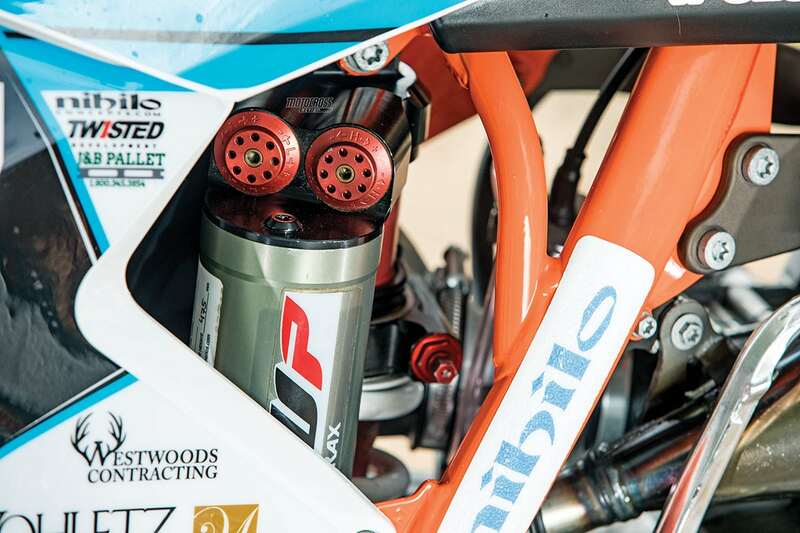 The WP Cone Valve forks and Trax shock were tuned by Powerband Racing in Minnesota. Dubya hubs were laced to D.I.D DirtStar rims shod with a Hoosier rear tire and Dunlop MX3S front. A full Hinson clutch was also installed. 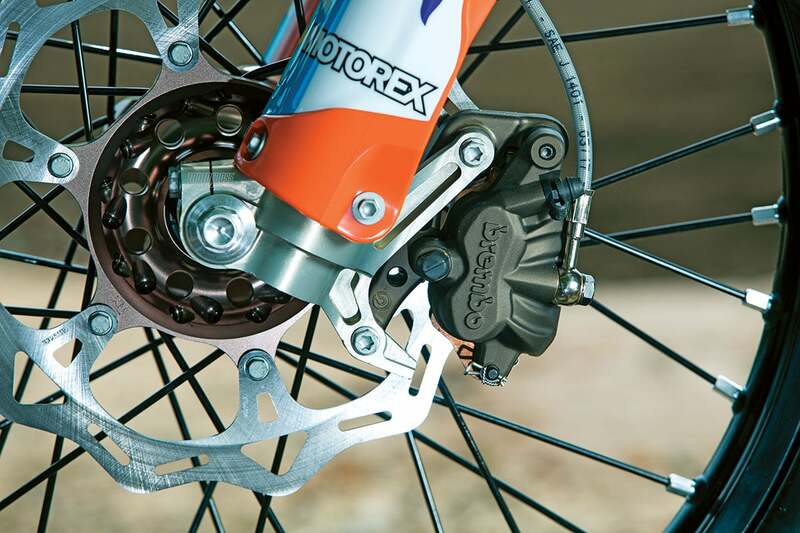 A WP Trax shock with Supercross valving was used. 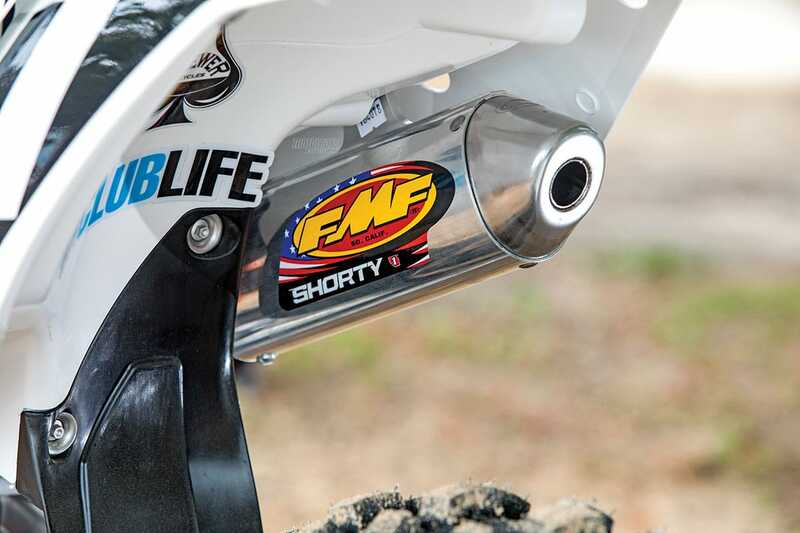 The FMF Shorty silencer gave the bike its crisp two-stroke sound. This was a fun and playful bike to ride, especially with the green scenery and chocolate-cake dirt offering prime traction. We didn’t even mind the super-stiff suspension, as it allowed us to hit big jumps and not worry about over-jumping and coming up short. The rear Hoosier tire had a soft compound and seemed to track well in ruts. Given its tall sidewalls, it had plenty of cushion. 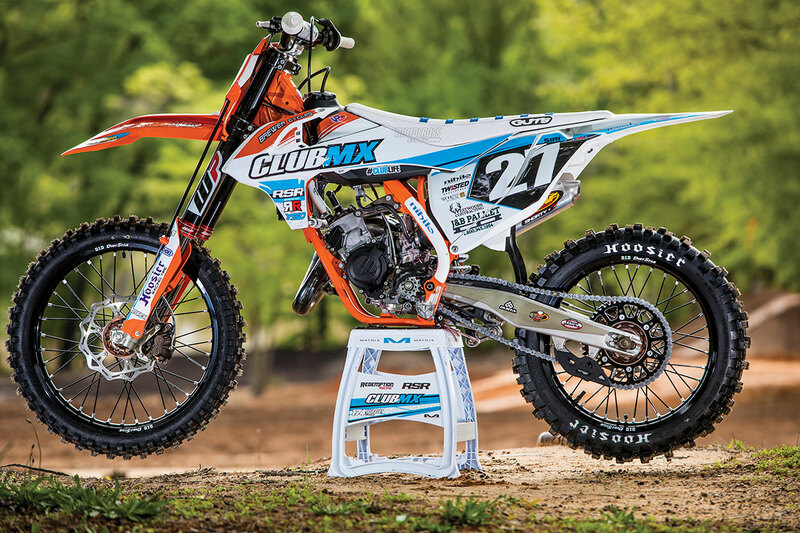 This ClubMX KTM 150SX is a replica of the race team’s KTM 250SXFs. What did we really think? We couldn’t persuade anyone to ride this bike for its intended use on the ClubMX Supercross track. We would have had to enlist a tiddler specialist from the good old days—when the stadiums rang with the high-pitched shriek of 125 smokers. They are in short supply, which made ClubMX guilty of wishful thinking. We want to see smokers line the gate inside stadiums again as much as anyone, but the only way that will happen is if Gared Steinke is put in charge of running the AMA. We would vote him in; wouldn’t you?